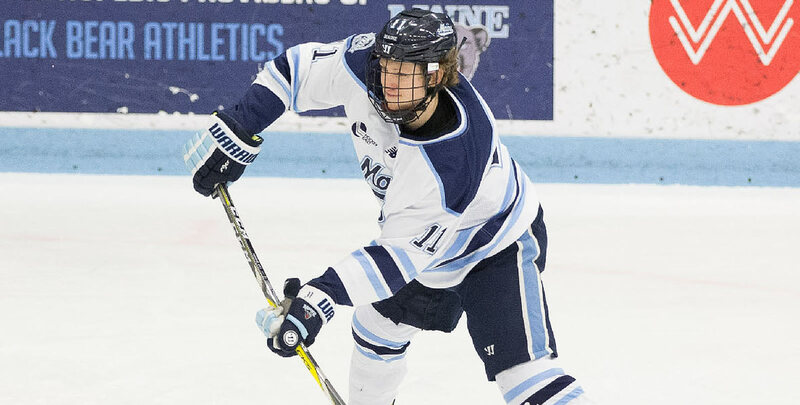 ORONO, Maine - Mitchell Fossier and Jacob Schmidt-Svejstrup both scored two goals for the Black Bears as the University of Maine men's hockey team defeated the University of Prince Edward Island Panthers, 6-1, on Monday night at the Alfond Arena. GOAL 1 (1-0 Maine): Mitchell Fossier took the shot from the far corner on an open net, taking a pass across the high slot on a long pass across the slot from Jacob Schmidt-Svejstrup on the power play. Brady Keeper was credited with the secondary assist on the play. Goal 2 (2-0 Maine): Fossier scored from the same position in the nearside circle on a 5-on-3. As the first power play expired, Rob Michel chipped a pass to Brady Keeper, who sent it from the nearside point across the slot to Fossier. Goal 3 (Maine 3-0): Eduards Tralmaks negotiated a short pass from Tim Doherty on the 4-on-4 and cut in with room in the slot, dishing in a backhand shot as he came in on goal. Goal 4 (Maine 4-0): Schmidt-Svejstrup scored after firing a puck off the post seconds earlier, the puck flipped behind the net where he took a pass from Fossier to send it in from his perch on the nearside face off circle. Alexis Binner earned an assist on the play, as well. Goal 5 (Maine 5-0): Alexis Binner sent the pass through center, connecting with Tralmaks at the nearside face-off circle. Tralmaks fired a pass through traffic in front as the goalie faded through to his side, giving Adam Dawe the space to shovel the puck in on an open net. Goal 6 (Maine 5-1): UPEI scored at 3:40 of the third period, Luke Kirwan netted the goal with assists from Alex McQuaid and Nick Shumlanski. Goal 7 (Maine 6-1): Schmidt-Svejstrup scored a power play goal from the near side faceoff circle with a hard one timer, handling a pass from Adrian Holesinsky from the corner. Rob Michel helped with a secondary assist. UMaine ended up with the final edge in shots on goal (39-28). The Black Bears went 4-for-7 on the power-play while the Panthers were 0-for-3. -All three Maine goaltenders made an appearance, Swayman made four saves in the first, Mundinger recorded 15 in the second, and McGovern finished the game with eight in the third. -This was the first matchup between the Black Bears and Panthers. The Black Bears open the regular season in earnest on Friday, Oct. 12 when the St. Lawrence Saints come to Alfond Arena for a two-game series.